APPEARANCE: Nyūnai suzume has the appearance of an ordinary russet sparrow, but in reality it is the ghost of an imperial attendant named Fujiwara no Sanekata. LEGENDS: During the reign of Emperor Ichijō (960-1011 CE) lived a nobleman named Fujiwara no Sanekata. One day he got into a quarrel over some gossip started by Fujiwara no Yukinari, and in a rage, Sanekata snatched Yukinari’s hat and threw it away. For his bad temper, Sanekata was demoted and exiled far away to a solitary island in Mutsu province in the northeast. There, Sanekata nursed his resentment towards those back in the court at Kyoto, growing ever more resentful of them. Three years into his exile, he died, with thoughts of vengeance poisoning his heart. When the news of Sanekata’s death reached Kyoto, a strange thing began to happen: every morning, when the servants would place food out for the imperial court to eat at the Seiryōden palace, the nyūnai suzume would swoop in and gobble up all of the food in an instant, and then fly off. No matter how much food was laid out, the sparrow would devour every grain of rice, leaving nothing for the palace inhabitants. It was not long before the court began to grow very scared of this bird. 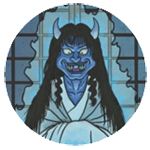 It began destroy all of the crops in the fields, as well, and nobody knew how to stop the sparrow’s attacks.Rumors began to spread that the sparrow could only be the vengeful ghost, or onryō, of Fujiwara no Sanekata, desperate to return and take revenge upon the imperial court. At the same time, the high priest of Kangaku-in, Saint Kanshi, had a sparrow visit him in a dream. The sparrow identified itself as the spirit of Sanekata, desperately longing to return to his beloved Kyoto, and asked the priest to chant and pray for him. The next morning, Kanshi discovered the body of a single sparrow lying dead at the base of a tree on the temple grounds. 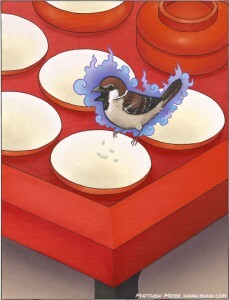 He recognized the sparrow as the transformed spirit of Fujiwara no Sanekata, and built a small grave for the sparrow, mourning it and praying for its soul. After the sparrow’s grave was built, the attacks stopped. Years later, Kangaku-in’s name changed to Kyōjaku-ji, or Sparrow Temple, and while the Kyoto has changed dramatically since that time, the little grave where the sparrow was buried still remains to this day. Fujiwara no Sanekata’s legacy lives on, too, in the common Japanese name for the russet sparrow: nyūnai suzume.